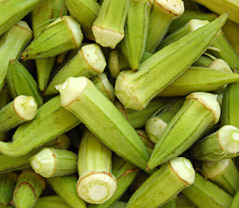 Whole or Cut Okra is prepared using whole, fresh, sound okra that are free from all toxic residues and taints. They are washed, blanched, sorted, drained, frozen using Individual Quick Freezing techniques, and packed. The packed cartons are fed through a metal detector and transferred to the cold store at -18° C. The entire process is carried out under strictly hygienic conditions.